Heat sugar and 1/4 cup water in a large saucepan over medium heat, swirling pan occasionally, until mixture is bubbling and very dark brown, about 8 minutes. Whisk in the remaining 1/4 cup water, fish sauce, ginger, garlic, and pepper flakes. 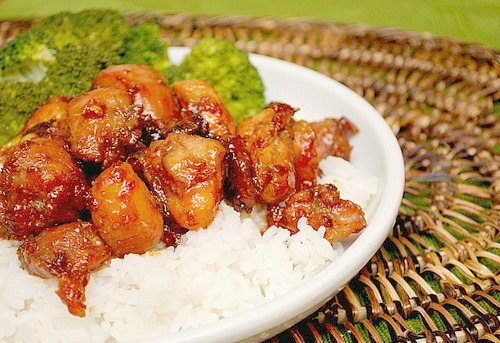 Stir in chicken and cook until the sauce is thickened and sticky and chicken is tender, about 10-15 minutes. Serve with steamed jasmine rice. That looks great. I like the use of ginger with the brown sugar. Do you think you would need to use the fish sauce? Joy - the fish sauce is definitely a key ingredient in this dish to make it 'Vietnamese Style.' If you aren't able to access it or use it for dietary reasons, a substitution you could use is 1 part soy sauce + 1 part lime juice + 1 mashed up anchovy or a 1/2 teaspoon of anchovy paste. Can you marinate and freeze this? This was wonderful! This was my first experience cooking with the fish sauce, and I was nervous, but it was delicious! The only problem I had was that my sauce didn't get quite as thick and didn't look quite like the picture. I'm sure it was a humidity issue. In the end I took out the chicken at the end of its cooking time (was afraid of it getting rubbery), then continued to boil down the sauce until it thickened some more then added the chicken back in to coat. I made some jasmine rice with coconut milk in place of half the water, some lime zest and cilantro. Served with steamed veggies. I can't wait to make it again! My family loved it, too. I made this with tofu tonight. Very very tasty. Thanks Joelen! Ridiculously easy and good! Wanted to share the love on my blog so I linked up with your page! Thanks for the recipe! This recipe is so good, my THREE year old asked me to make her "favorite chicken" for the second time in two weeks. My kids rarely remember a meal or ask for it a second time. Well done! I have to make a double batch this time. Made this for dinner last night. It was so easy, and so flavorful! Excellent meal! *sigh* Attenoted to make this, but my chicken released A LOT of water and it never got "sticky." The flavor was there though, so it still tasted good. Gonna attempt it again, but I just gotta figure out how to get the water out of the chicken thighs.